Sold out tickets and jam-packed venues are evident which means Filipino fans practically live and breathe concerts. Grab this priceless opportunity to catch your favorite artists live as we continue our list of the upcoming foreign concerts in Manila. 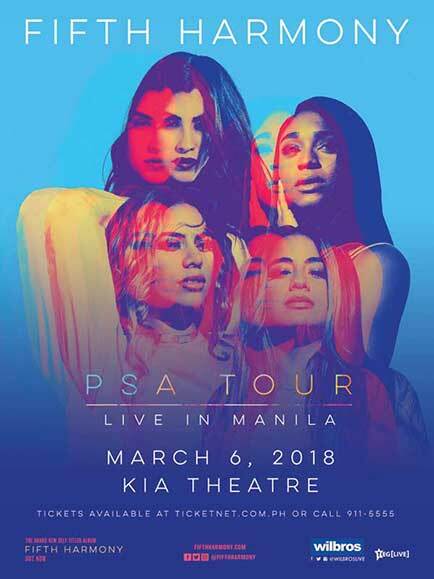 The reality-TV creation and multi-platinum selling group Fifth Harmony is bringing the beauty of harmonizing to Manila, with their third album via Syco/Epic Records topping the charts around the world upon its August 25 release. More than the voice, the global pop and RnB quintet are more entertaining with their precise moves on stage. 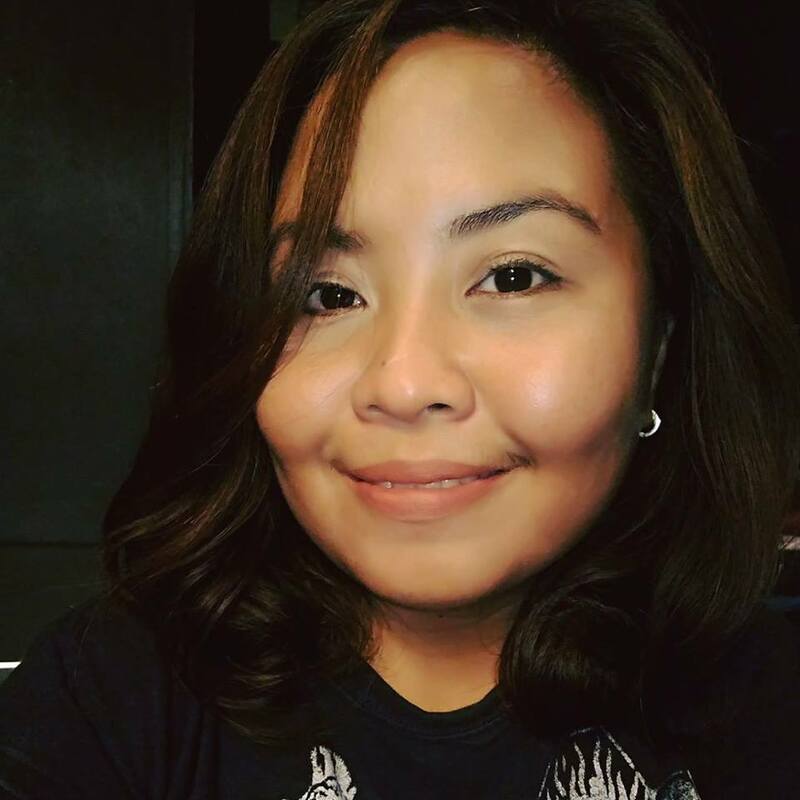 The five female singers namely Ally Brooke, Camila Cabello, Normani Hamilton, Dinah-Jane Hansen and Lauren Jauregui entered the second season of “The X Factor USA” in 2012 as individual performers, and eventually was regroup by English reality television judge and producer Simon Cowell. They won third place in the talent competition and hit the stage offering their unique harmony of vocal performances. Founded in in 2009, Foster the People achieved success with the 2011 release of their debut album Torches featuring the #1 hit single “Pumped Up Kicks.” It sold nearly 2 million albums and over nine million singles worldwide. 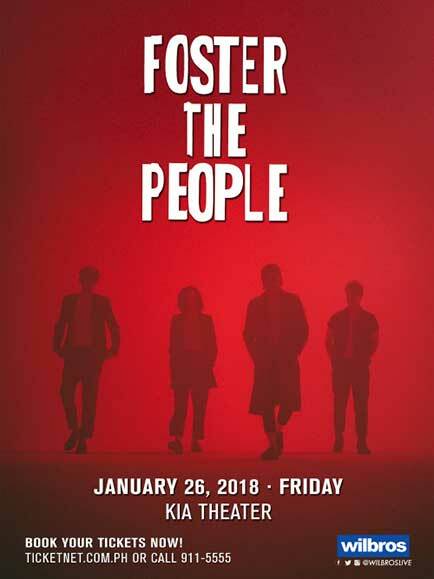 Foster the People’s coming to Manila will spread the incredible fun and rhythmic mood going as they are also introducing their third record entitled Sacred Hearts Club. Since then, they have been filling dance floors worldwide with headline tours and performing at some of the biggest international music festivals including Coachella, Glastonbury and Lollapalooza. 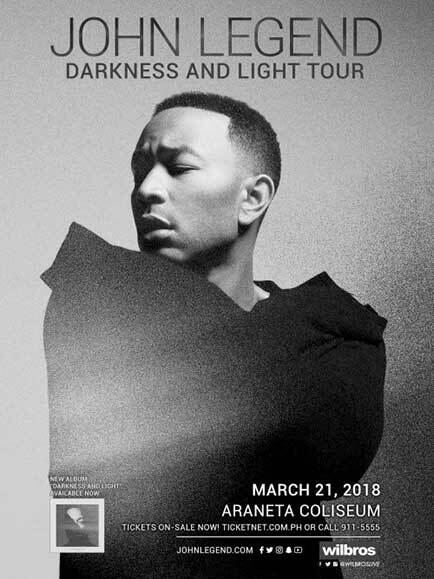 Neo-soul superstar and multi-platinum selling singer-songwriter John Legend returns to Manila for his highly anticipated Darkness and Light World Tour as he promotes his album of the same title debuting the Top 20 of the Billboard 200 and was streamed over 12-million times on its first week. Darkness and Light has been a worldwide smash hit with the chart-topping singles “Love Me Now” and “Penthouse Floor” featuring Chance the Rapper. The 10x Grammy Award winner and velvet-voiced superstar will be true to his calling as he performs with his full live band, as well as his well-loved singles “All of Me,” “Ordinary People,” “Green Light,” “Used To Love U,” “Save Room,” “Tonight (Best You Ever Had),” and more. We adore his finessed pop, soul, hip-hop and R&B into enticing contours. 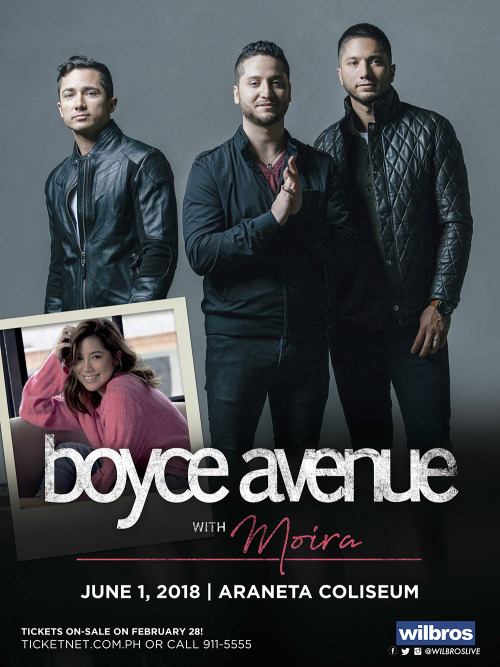 Florida-based band Boyce Avenue, one of the biggest independent bands in the world because of their distinctive acoustic covers, are coming to Manila for a one-night concert on June 1st at the Araneta Coliseum, together with the Philippines’ most streamed local artist, Moira. Boyce Avenue namely Alejandro (lead vocals, guitar, piano), Fabian (guitar, vocals) and Daniel (bass, percussion, vocals) has also sold in excess of 10 Million songs and 1 Billion streams and has had the privilege of touring the world several times, selling more than 600,000 tickets in over 30 countries, including most recently, a sold-out show at the legendary Royal Albert Hall in London, on November 2017.. The videos resonated instantly and to date, the band’s YouTube channel has amassed over 3.7 BILLION Views and over 10.6 MILLION Subscribers. On YouTube, the band is ranked above such artists as Justin Timberlake. Drake, Miley Cyrus, Sia, and Imagine Dragons. The brothers have forged a lasting and passionate digital fan base on other platforms as well, with over 3 MILLION Facebook likes and a half million Twitter followers. 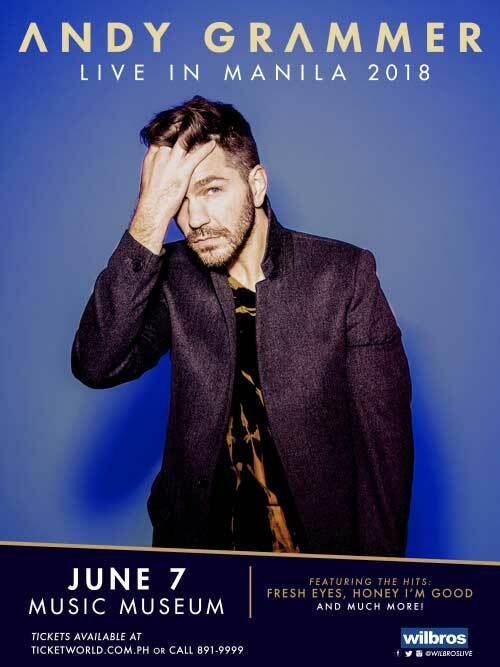 Multi-platinum selling pop artist Andy Grammer is coming to Manila for a special and intimate concert on June 7th at the Music Museum. This music genius is all about inspiring and empowering the world by communicating his truths through his music. 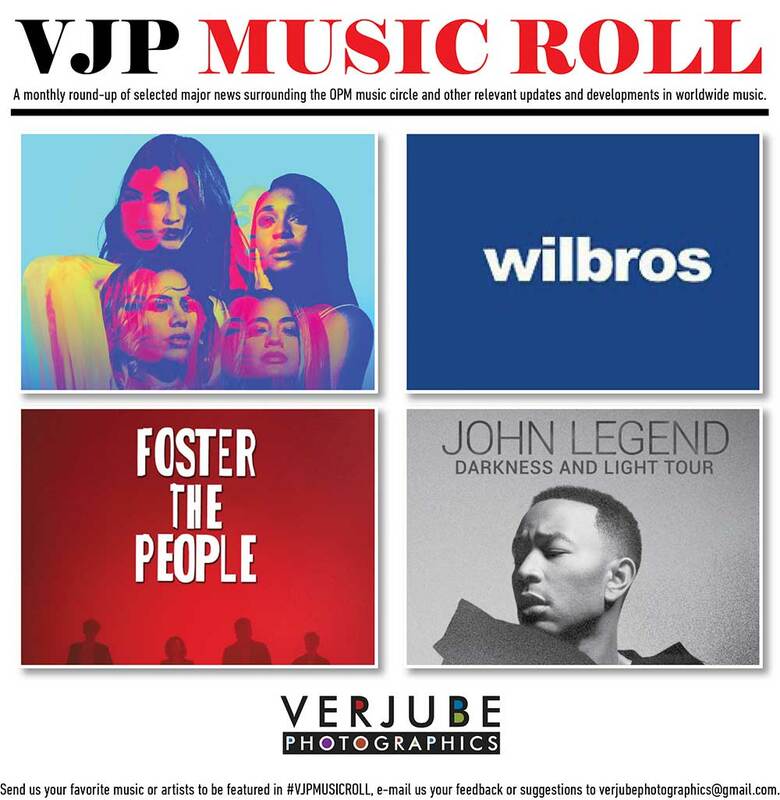 The first male pop star in a decade since John Mayer to reach the Top 10 at Adult Pop Radio on his first two singles, Grammer has taken the music world by storm with a succession of anthemic pop hits, 6 of which are certified gold or better. You are cordially invited to “The Invitation Tour”. 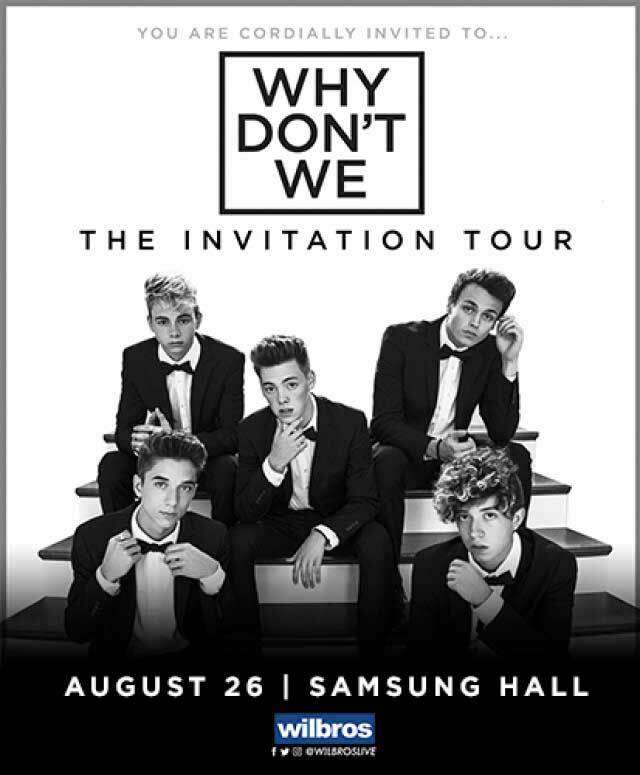 Atlantic recording group – WHY DON’T WE– Daniel Seavey, Zach Herron, Corbyn Besson, Jonah Marais, and Jack Avery – are excited to be coming to MANILA for the first time and will be bringing their headline tour on August 26, 2018 at the Samsung Hall. 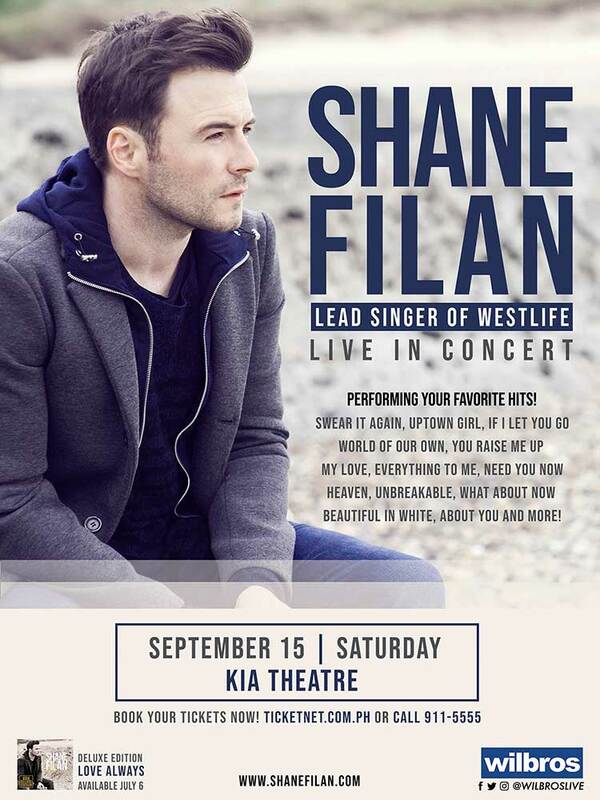 Westlife’s lead singer Shane Filan is coming back to Manila for his much-awaited live concert featuring Westlife’s greatest hits and more on September 15 at the KIA Theatre. 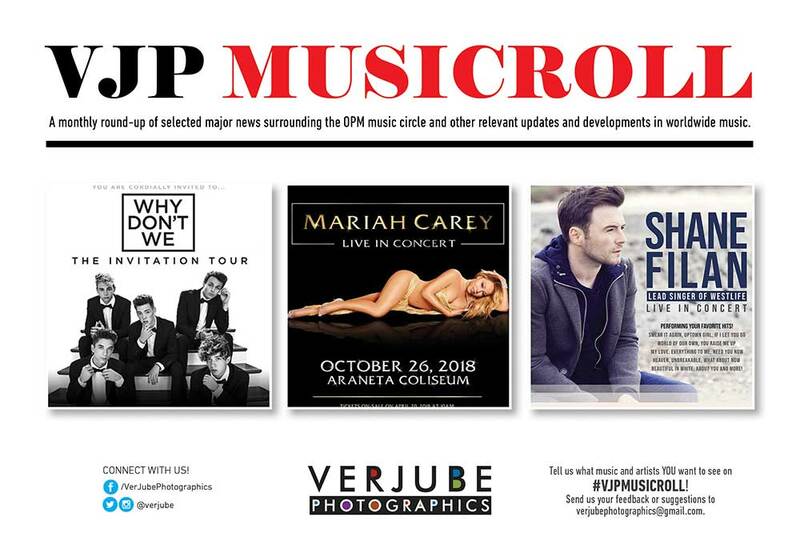 Filipino fans will hear their favorite hits like “Swear It Again”, “Uptown Girl”, “If I Let You Go”, “World of Our Own”, “You Raise Me Up”, “My Love”, “Everything To Me”, “Need You Now”, “Heaven”, “Unbreakable”, “What About Now”, Beautiful in White”, “About You” and more. With his third album, Love Always, delighting both fans and critics, Shane’s solo career is quickly gaining momentum. Its already been a huge hit all over Asia, securing the number one spot in the Philippines and Indonesia, Love Always has proved a major hit with fans. Mariah Carey is the best-selling female artiste of all time with more than 200 million records sold worldwide to date and eighteen Billboard #1 singles (seventeen self-penned) including ‘Hero’, ‘Fantasy’, ‘Always Be My Baby’, ‘Honey’, ‘One Sweet Day’, ‘Without You’, ‘Touch My Body’, ‘We Belong Together’, ‘Don’t Forget About Us’ and the global smash hit Christmas single ‘All I Want for Christmas Is You’, more than any solo artiste in history. With her distinct five-octave vocal range, prolific songwriting, and producing talent, Mariah has defined the modern pop performance. As a singer, songwriter and record producer, she has been recognized with five Grammy Awards, nine American Music Awards, Billboard’s “Artist of the Decade” Award, the World Music Award for “World’s Best Selling Female Artiste of the Millennium,” and BMI’s “Icon Award” to name a few.